As I've said before, I don't like seafood. I have tried almost everything, and still try whatever Jon orders at restaurants, but really don't like it. However, I don't mind catfish and trout because they are freshwater fish and don't have that typical seafood flavor. Jon was away all week so I decided to cook him some fish when he got home last night. 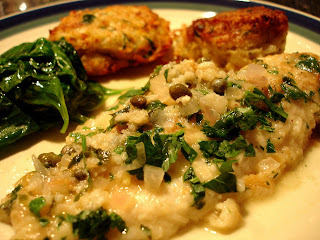 Because I need to hide the taste of the fish a bit, I decided to cook it similarly to how I cook chicken piccata. Heat olive oil and 1 tbsp butter in a large pan over high heat. Season fish with salt and pepper, and then dredge in flour, shaking off any excess. Once the pan is very hot, add the fish and cook on each side for about 2-3 minutes. Remove from pan. Lower the heat to medium-high, and to the pan, add garlic and shallots. Saute for 1-2 min. Add the wine and let it cook for about 2 minutes. Add the chicken broth, lemon juice, and capers. Return fish to the pan and simmer about 4-5 minutes. At the end, whisk in 1 tablespoon of butter and top with parsley. I really liked the flavor of the sauce, and I was able to eat a lot of the fish. Jon also liked the sauce, but thought the fish got a little too soft in the sauce, but still enjoyed it. I made potato-artichoke pancakes as a way to try to get Jon to enjoy potatoes. It worked - he ate two! Mix all ingredients in this order - potatoes, artichokes, garlic, shallots, spices, egg, parsley, breadcrumbs, cheese (I added 1 egg, then the breadcrumbs and cheese, then decided to add a second egg). Drop patties into the oil and cook for about 4 minutes on each side until golden brown. These were really good and if I didn't already have the lemon sauce for the fish, I would have liked some sort of creamy dipping sauce for them. I can't believe Jon ate 2! Everything looks delicious. 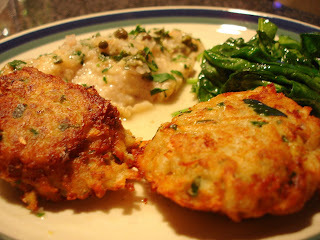 Love the artichoke potato pancake idea. We just made these dishes this evening and my husband loved the flavor of the fish. We used whiting filets and had some sauteed kale on the side of all of it. I agree that the pancakes could use some sort of dipping sauce, but overall I thought it was all tasty and will make it again.